Mon., March 12, 2018, 11 p.m.
WASHINGTON – Alex Ovechkin scored twice to reach 600 goals and Evgeny Kuznetsov had the overtime winner as the Washington Capitals returned to first place by beating the Winnipeg Jets 3-2 on Monday. Ovechkin scored in each of the first two periods to get to 42 this season. The Russian winger became the 20th player and fourth-fastest in NHL history to 600 goals and is on pace to lead the league in goals for the seventh time. 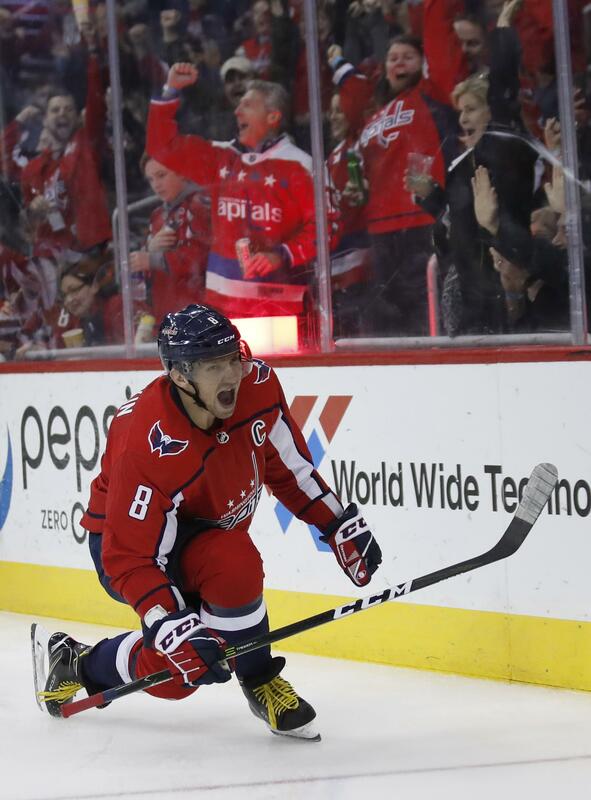 Kuznetsov made it a night of celebration for Washington by scoring on a breakaway 4:11 into overtime. Jets winger Patrik Laine scored his 16th in the past 12 games to get to 41 goals this season. Nikolaj Ehlers also scored a 4-on-4 goal for Winnipeg, which got 40 saves from Connor Hellebuyck. Capitals goaltender Philipp Grubauer stopped 26 shots in his third consecutive start. PHILADELPHIA – Marc-Andre Fleury made 38 saves to become the 13th goalie in NHL history with 400 career victories, and Ryan Carpenter scored the winning goal for Vegas with 2:40 left. Erik Haula and William Karlsson also scored for the Pacific Division leaders, who completed a 4-1 road trip. Fleury, who earned his first NHL win on Oct. 18, 2003, became the third active goalie to reach the milestone, joining Roberto Luongo and Henrik Lundqvist. Claude Giroux and Wayne Simmonds scored for the Flyers, who have lost six of seven. LOS ANGELES – Jonathan Quick made 35 saves for his fourth shutout of the season and Los Angeles moved back into playoff position. Tyler Toffoli, Anze Kopitar and Tanner Pearson scored for the Kings, who jumped into third place in the Pacific Division with their fifth victory in seven games. Los Angeles is one point ahead of Anaheim in the division standings. Anders Nilsson made 30 saves for the Canucks, who were shut out for the second consecutive game. Vancouver has scored three goals during a four-game losing streak. COLUMBUS, Ohio – Seth Jones was the driving force behind two power-play goals in the first period, helping the Blue Jackets to their fifth consecutive victory. Alexander Wennberg had a goal and three assists for Columbus, and Nick Foligno, Boone Jenner and Ian Cole also scored. Behind a run of eight wins in 11 games overall, the Blue Jackets moved past idle New Jersey into the first wild-card position in the Eastern Conference. Columbus also pulled within two points of third-place Philadelphia in the Metropolitan Division. Brendan Gallagher and Jonathan Drouin scored for banged-up Montreal, which has lost five straight. The Canadiens have been playing without Carey Price, Max Pacioretty and Shea Weber. NEW YORK – Jimmy Vesey scored three times, Mats Zuccarello had two goals and the Rangers stopped a three-game slide. Vladislav Namestnikov also scored for the Rangers, who earned their first home win since Feb. 9. Pavel Buchnevich and Mika Zibanejad each had three assists. Backup goalie Alexandar Georgiev made 41 saves for his second win of the season. Teuvo Teravainen, Lee Stempniak and Victor Rask scored for the Hurricanes. Scott Darling, who has struggled in his first season with Carolina, made 17 stops. SUNRISE, Fla. – Matt Duchene scored twice, including the go-ahead goal with three minutes left, and Ottawa got the road win. Magnus Paajarvi also had two goals for Ottawa, and Jean-Gabriel Pageau added one late. Craig Anderson made 35 saves, and Erik Karlsson and Mike Hoffman each added two assists. Jonathan Huberdeau, Mike Matheson and Evgenii Dadonov scored for the Panthers, who had won eight straight home games. Vincent Trocheck had two assists, but Roberto Luongo allowed five goals on 25 shots. The Panthers are three points behind New Jersey for the final playoff spot in the Eastern Conference. Published: March 12, 2018, 11 p.m.